Congratulations! You’re ready to purchase a used truck that’ll send you soaring down the highway like a champion. Luckily for you, pre-owned pickups come in a huge variety of all shapes, sizes, capabilities, and model years. That way, you’ll be sure to opt for the vehicle that’s ideal for your needs. 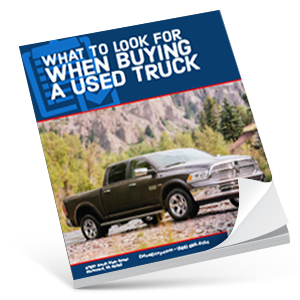 And to help you navigate the roads of your used truck shopping experience, we’re here with this What to Look for When Buying a Used Truck eBook. Within the pages of this guide, you’ll discover more about the best practices for selecting the car that’s perfectly suited to your adventurous lifestyle. On top of that, this FREE eBook comes packed with a collection of handy coupons that’ll help you save some cash when it’s time for you to snag a used pickup. With all the benefits contained inside this What to Look for When Buying a Used Truck eBook, why would you wait around to take advantage of these perks? Download your copy by clicking the link on this page today! Once you’ve finished reading, remember to save this eBook to your computer to refresh your mind on these useful tips.